The Sacred Page: Milgrom vs. Gane: What Did the Old Testament Sacrifices Do? Milgrom vs. Gane: What Did the Old Testament Sacrifices Do? A seriuous contribution to the study of the Old Testament sacrificial cult has just been made. Let me explain. Anyone doing work in Leviticus these days know that there is a major debate regarding the theological rationale behind the rituals of atonement, particular those of Yom Kippur and the hatta’t (the “sin-offering”). In essence, Milgrom wants to move us away from the idea that the offering cleanses the offerer himself--it is the sanctuary that is primarily in view. He compares the theology of Leviticus to the Portrait of Dorian Gray. The fundamental idea is that transgressions against the Lord are borne by the sanctuary. 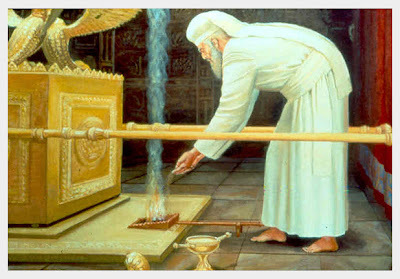 The sacrifices effectively purify the sanctuary from the resulting impurity incurred by Israel. The fact is, however, most of those who have taken Milgrom on are Christians who clearly have theological reasons for opposing his view. Of course, that's not to say that an anti-Christian polemic may be at work in Milgrom's view. Nonetheless, most of the critiques of Milgrom's work come in the form of sections of works dealing with Christian atonement theology. An in-depth, comprehensive treatment of the Levitical law code has been sorely needed. In fact, Milgrom wrote a response to Gane’s work, “The preposition מן in the חטאת Pericopes,” in the Journal of Biblical Literature 126 (2007):161-63. There Milgrom offers a respectful response to Gane’s argument. For example, Gane looks at the use of the preposition in Leviticus 15:15b, which describes the case of a person who has contracted ritual impurity because of a discharge: “the priest shall offer [two turtledoves or pigeons], one for a sin offering and the other for a burnt offering; and the priest shall make atonement for him before the Lord [מן = for, from, or on behalf of?] his discharge.” Here Gane argues that the preposition Nm should be translated as indicating that the priest is to effect purgation on behalf of (=for the benefit of) the offerer from his discharge―in other words, the sacrifice is meant to remove residual impurity from him. But Milgrom believes this is “simply incomprehensible. Purgation (כפר) is not offered ‘from’ but ‘for, because of’― ‘his flow’ (15:15)…” In other words, Milgrom believes the sanctuary is what has been defiled because of the person’s sin―the offering therefore is made to atone/purge it. Thus, the offering is made on behalf of the impurity caused by the discharge. Today I received the latest edition of the Journal of Biblical Literature and..., lo and behold, the first article is written by Gane: “Privative Preposition מן in Purification Offering Pericopes and the Changing Face of 'Dorian Gray.'" There’s much more, but I can’t discuss it all here. To sum it up though, Gane’s piece is so clear I believe it will represent the standard view. Milgrom has made a tremendous contribution by refocusing us on the purity concerns of the Old Testament cult, but he is wrong to deny that it is also related to the individual offerer. Gane is absolutely correct: the sacrifices effected something for the offerer―not merely the sanctuary. I think Gane just closed the door on that debate in this article. See Milgrom, Leviticus 1-16, 254. In addition, see Jacob Milgrom, “Studies in the Temple Scroll,” JBL 97 (1978): 501-523; idem., “Israel’s Sanctuary: The Priestly ‘Picture of Dorian Gray,’” RB 83 (1976): 390-99. Stephen Finlan, The Background and Context of Paul’s Cultic Atonement Metaphors (Atlanta: Society of Biblical Literature, 2004), 33. Check out Margaret Barker's article "Atonement: The Rite of Healing", where hse builds on Milgtom to argue that sin not only pollutes the temple, but pollutes the cosmos, of which the temple is the microcosm. Thus atonement is an act of cosmic renewal and repair that holds back the wrath from breaking in. In his very introductory book, Lovely Like Jerusalem, Fr. Aidan Nichols OP asserts that "The system of offerings was not understood as a final and comprehensive way of dealing with sin of all kinds. Much of the atonement procedure was concerned with accidental sins, sins of inadvertence, and sins of omission" (30). In the Old Covenant sacrificial system there existed "No means of forgiveness...for sins of commission deriving from sheer malice. Sins deriving from contempt or hatred for the divine commands led to excommunication from the covenant community, as the succeeding book of the Torah, Numbers, makes plain in 15:30-31. For such fundamental breaches of the covenant as apostasy or idolatry no sacrifice was of any avail--something that must be borne in mind when in the Prophetic Books we find texts apparently repudiating cultic sacrifice as the divinely provided means of reconciliation. These sacrifices were not intended as reconciliation for sins like those" (30-31). I've heard this view in a side comment from N.T. Wright and wondered what your take on it was: is this correct? why was this the case? I recall Aquinas saying that the remarkable thing about sin is not that there is mortal sin, but that there is venial sin, a sin that is not unto death. I too have been following this exchange, but for a different reason. Roy Gane is a Seventh-day Adventist, a professor at an Adventist school, and his view on the Levitical system is essentially a scholarly defense of the Adventist view. I recently left the Seventh-day Adventist ministry over my disagreement with the Adventist interpretation of the fulfillment of the Day of Atonement, and some of its interpretation of the Levitical types. Without going into tons of details Adventists believe that the Day of Atonement fulfillment began in 1844 and consists of a judgment on all "professed believers" in God. Now having listened to Gane personally recount how he came to his view I don’t think he necessarily bought into the Adventist view because of his Adventist upbringing, but rather that he was aware of that explanation and in wrestling with the overall issues when studying under Milgrom he found it to be a better explanation than Milgrom’s. I agree completely that the sacrifices benefited the one making an offering. In fact I think overall Gane’s work was a quite thorough explanation of one view of the workings of the Levitical sanctuary. But another aspect of Gane’s view is troubling to me and also has great implications for Christian theology. This deals with the mechanism for defilement of the sanctuary in the first place. And this part of Gane’s view is now poised to go mainstream in a big way through this discussion with Milgrom. Gane proposes that the confessed sins of the believer are transferred through the blood manipulation to the sanctuary and then are cleansed on the day of atonement. Now as I said I have no issue with the sacrifices benefiting the individual. I think that is plain in the text. But the question is do they benefit the individual by transferring the sin or by atoning for it? And is the sanctuary only defiled by confessed sins or all of the sins of the people in the camp? Is it defiled only when the blood rite is performed by the penitent or is it defiled immediately upon commission? Clearly Milgrom argued it was defiled by commission. Gane says differently, seeing the defilement as particularly caused by blood manipulation of the sacrifices for the confessing sinner. Here is a brief overview of the Adventist understanding of how sin worked in the earthly tabernacle:. C. The animal is killed and the blood transfers the sin ritually to the sanctuary. D. The sanctuary is cleansed at the end of the year from the sanctuary on the Day of Atonement. E. The sins are placed on the scapegoat. The blood which was ministered is seen then as a record of sin, stored in the sanctuary. Now here is what the Adventist say this symbolizes in the reality, as it relates to the sacrifice of Christ. B. The sinner confesses, trusting in the sacrifice of Christ. A record of confession is made. C. In 1844 Jesus begins going through the case of each “professed “ follower of God, because in the earthly only those who had confessed their sins at the sanctuary and who followed the day’s stipulations benefited. (Those who are not professed followers are assumed to be lost). Any confessed sins are cleansed. Any un-confessed sins are not cleansed and condemn the sinner. D. The sins are then placed on Satan, who is believed to be the scapegoat. The Adventist view then has Jesus blood not cleansing at the time of confession, but transferring. And only confessed sins are cleansed. And even then they are transferred to Satan. But the text has the blood cleansing, rather than defiling the sanctuary. Lev 6:25 Speak unto Aaron and to his sons, saying, This is the law of the sin-offering: in the place where the burnt-offering is killed shall the sin-offering be killed before Jehovah: it is most holy. Lev 6:26 The priest that offereth it for sin shall eat it: in a holy place shall it be eaten, in the court of the tent of meeting. Lev 6:27 Whatsoever shall touch the flesh thereof shall be holy; and when there is sprinkled of the blood thereof upon any garment, thou shalt wash that whereon it was sprinkled in a holy place. Lev 6:28 But the earthen vessel wherein it is boiled shall be broken; and if it be boiled in a brazen vessel, it shall be scoured, and rinsed in water. Lev 6:29 Every male among the priests shall eat thereof: it is most holy. Lev 6:30 And no sin-offering, whereof any of the blood is brought into the tent of meeting to make atonement in the holy place, shall be eaten: it shall be burnt with fire. c. blood that was splattered was to be washed in a holy place. How then can we say that the sacrifice was defiling the sanctuary, transferring the sin? Anything that the sacrifice touched was holy, not defiled. It appears the sacrifice cleansed, rather than defiled. In the description of the rite the sacrifice made atonement—not just temporarily transferred sin. Clearly the sinner benefits, and not just the sanctuary. In fact I think the individual sin offerings were primarily for the sinner, while Day of Atonement was more of a an “annual reminder of sins” as Hebrews puts it, and a corporate cleansing of the people and of the Sanctuary which is where God dwelt among the sinful people. But in both the individual sin offering and the annual offerings the blood CLEANSED not just transferred. And of course the larger problem with the Adventist view is that Hebrews 9 and 10 clearly show Jesus fulfilling all of the sacrifices AND the entry and cleansing associated with the day of atonement blood manipulation. That was the corporate provision for sin. But Adventist put this off until 1844 and make it not a cleansing but a judgment. Let me correct one aspect. I think the individual sin offerings illustrate both forgiveness for the individual and cleansing of impurity in the temple that was automatically present from the sin being committed. In other words I accept Milgrom' automatic defilement, primarily because it is the only one specifically mentioned in Scripture, even though Gane has a point that it is usually in reference to particularly heinous events where atonement was made by the death of the sinner himself. The yearly then is just another illustration of the same principle, cleansing the people corporately from sin and the temple as well.